Palestinian Ambassador to Turkey Faed Mustafa said Wednesday that Palestine’s “great tragedy” had begun with the 1917 Balfour Declaration, in which Britain signaled its support for “a homeland for the Jewish people” in Palestine. 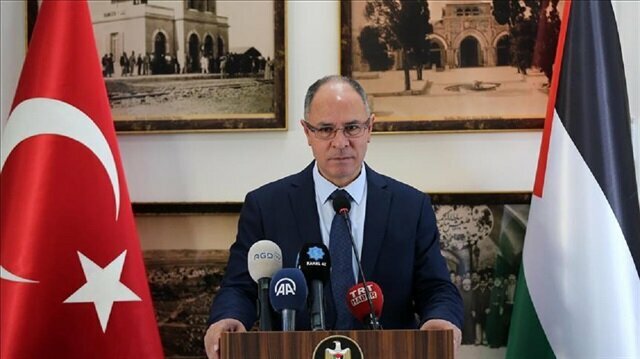 At a press briefing held at the Palestinian embassy in Ankara, Mustafa blamed the fateful document for “100 years of genocide”. He went on to say that the declaration effectively “gave away” Palestinian land to a nation that had “no right to establish a state” in the region. The ambassador also criticized the current U.K. government for its refusal to apologize for its role in Israel’s usurpation of Palestinian land in 1948. The U.K. needs to take responsibility for what it did a hundred years ago, act to end the occupation of Palestine and help in the creation of two states in the region, a former senior British envoy to Jerusalem has said.Speaking to Anadolu Agency on the centenary of the 1917 Balfour Declaration, Sir Vincent Fean, Britain’s consul general to Jerusalem from 2010 to 2014 -- a de facto ambassador to the Occupied Palestinian Territories -- underlined the necessity of recognizing a Palestinian state.“We should assume responsibility as British people for what Britain did in our name a hundred years ago and we should act to end the occupation and to help to create two states in the Holy Land… on the borders of ‘67,” Fean said.Recognition of a Palestinian state “is the beginning of the solution,” but not the only thing which needs to happen, according to Fean:“There needs to change on the ground. The wall, the settlements, the closure of Gaza; there are many things that need to change. Rockets coming out of Gaza -- that needs to change too. There is a lot of work to be done by many people.”- ‘Pernicious conflict’The former Jerusalem envoy also said he believed the Israel-Palestine conflict should not just be managed, but solved:“Often, bloodier conflicts like Syria, Yemen, Libya take center stage, but this is a pernicious conflict which is doing harm in the region, doing harm to Israelis -- doing harm to Palestinians even more -- and, I would say, even doing harm to us, to our self-respect.“So, to combat that and to end that, we need to focus on it, not just manage it, but act.“And Palestinians deserve no less.”The former Middle East Editor of the Guardian and London School of Economics (LSE) lecturer Ian Black, on the other hand, drew attention to the controversial content of the Balfour Declaration which paved the way for an Israeli state.Disagreeing with Prime Minister Theresa May who last week said the U.K. should celebrate the centenary “with pride”, Black told Anadolu Agency that “there is nothing to be proud of”.“This centenary is a problem for British government; it is embarrassed by it. There is no peace process, there is no hope of anything good happening any time soon on the Israeli-Palestinian front. And the Balfour Declaration is a very important moment in the history of the conflict," he added.Black said the problem is that May “has talked about marking [Balfour] with ‘pride’ and that has angered a lot of people because, of course, they think that there is nothing to be proud of.“It [the British government] said it will work [and] try to advance the peace process and work for a two-state solution. It has been saying this for a long time but not really has much happened as a result of it.”- No British apologyJournalist and author Jonathan Fryer said the Balfour Declaration, if it had been fully implemented, would not have resulted in as many problems as can be seen in the Middle East currently.Fryer, who is also a lecturer at London’s School of Oriental and African Studies, claimed the declaration “basically said the British government will be in favor of the creation of a Jewish homeland -- not necessarily a state, but a Jewish homeland -- providing that the religious and civil rights of the Palestinian people were not compromised".Fryer told Anadolu Agency Jewish immigration into Palestine accelerated in the 1930s and the local Arab population found “British colonial forces” ranged against them. "During the Ottoman Empire there was indeed a small Jewish community in Palestine but it was very much a minority and it is interesting that the Jewish immigration into Palestine really accelerated in the 1930s but it was at that stage it was invoked before the Arab revolt in Palestine which was very brutally repressed by the British colonial forces of the time.“...Many of the Arabs said: ‘We were happy to live with Jews with reasonable numbers but what is happening is more and more are coming and they clearly want to take over part of the country’," he said. “And that was the problem which eventually developed to the conflict we see today. ""In Britain we have a Conservative government which is indicated that it will celebrate the Balfour Declaration whereas the Balfour campaign is calling for an absolute apology.“That is not going to happen. There were many people in Britain who sympathize with that [government] point of view. "- Celebration with NetanyahuBritish lawmakers last week urged the government to honor all aspects of the 1917 Balfour Declaration, which 100 years ago set out the U.K.’s support for a Jewish homeland in Palestine.A debate took place at the House of Commons a few hours after Prime Minister May reiterated that her government would mark the 100th anniversary of the declaration “with pride”.“We are proud of the role that we played in [the] declaration of the state of Israel and we will certainly mark the centenary with pride. And I am also pleased of the good trade relations and other relationships with Israel,” May said at a weekly question session in the House of Commons.“We also must be conscious of the sensitivities that some people have about the Balfour Declaration and we recognize there is more work to done. We remain committed to the two-state solution in relation to Israel and Palestinians,” she added.Israeli Prime Minister Benjamin Netanyahu will join a dinner held on the occasion of the centenary, which will be hosted by Lord Jacob Rothschild and Roderick Balfour -- the representatives of Rothschild and Balfour families -- and joined by the prime minister.Britain's biggest opposition party, Labour, will be represented by shadow foreign secretary Emily Thornberry as party leader Jeremy Corbyn previously announced he would not attend. “Rather than addressing the mistakes of former governments, the current [U.K.] government is gearing up to celebrate it [the declaration’s 100th anniversary] with Israel,” Mustafa said. “We've asked [British Prime Minister] Theresa May to call off the celebrations, but she shamelessly said she was proud of it [the declaration],” he added. The Anadolu Youth Association, a Turkish NGO, is organizing protests on Thursday to mark the declaration’s 100th anniversary, Mustafa said, going on to express his thanks for Turkey’s longstanding support for the Palestinian national cause.